When it's beautiful outdoors, it can be really hard to make it to the yoga studio for practice. I totally get it! Every time folks show up to my Friday slow flow class around 5pm I'm amazed. Because it's not always realistic to make it to the studio, I whipped up an easy practice you can do at home! Depending on how long you like to hold each pose, you can expect this practice to be around 15 minutes. ​In this practice, we stretch those muscles we use a lot during the summer - the quads, hamstrings, and the hips. 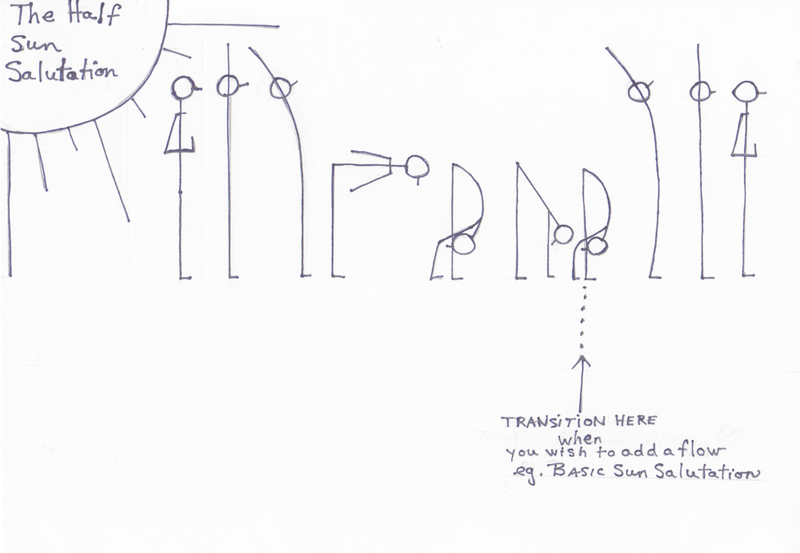 Additionally, we create space in the body through side bending and mild backbends - because, well, it's hot outside! Begin standing with the feet planted firmly into the ground. Notice where you tend to shift your weight, and see if you can balance your weight evenly through all corners of the feet. Hands can be together at the chest or down by the sides, palms facing forward. Then connect to your breath. Noticing the physical sensation of breath in the body. And take a moment to reflect on your day and set an intention for your home practice - whether that be the intention to ignore your to-do list for a few minutes, move with the breath, or something else that calls to you. Hold in tadasana for 1-3 minutes. Here we are going to move with the breath in order to connect with the body, before moving into postures we hold for multiple cycles of breath. Inhale the arms high, stretching upward, exhale to fold over the legs. Inhale halfway lift - palms come to the shins or thighs, engaging the back muscles by pressing firmly into the legs, exhale to fold over the legs. Inhale rise high to standing, arms come high. Exhale lower the palms to the chest or hands down by the sides. Repeat this for 3-5 total cycles. At the end of your last half sun salutation, you can hold in your forward fold. Bend the knees as much as you like here, maybe taking opposite elbows and swaying back and forth, or taking the hands to the base of the skull and giving yourself a little neck massage. To twist, bring your right hand in front of your right foot, bend deeply through the right leg, and inhale the left arm high. Gaze can stay toward the floor, or come up to the raised hand. Exhale to release and switch sides. From your forward fold, plant both hands and inhale to lift the left foot and exhale plant the toes behind you, lowering the back knee. Take a moment with your hands grounded, framing the front foot, to rock the weight side to side a bit, opening through the inner hip. As you're ready, inhale the arms high. Energetically draw the front foot and back knee together to engage the legs and core, lengthening through the lower back. Take a moment in center before clasping the thumbs overhead and opening through the chest. Take 3-5 breaths here before releasing the clasp, taking the left wrist with the right hand and side bending toward the right. Take 3-5 breaths here before releasing the arms down behind the back, clasping the hands, and taking an upper back bend. Maintain engagement through the lower abdominals to keep the opening through the upper (rather than lower) back. Inhale to draw the arms high, and exhale to frame the foot with the hands. From here, look behind you and bend through the left knee, drawing the foot toward the hip. Hold here with the knee bent, or reach behind you with your right hand to reach for that left foot, drawing it closer to the hips for a thigh stretch. (You can also wrap a strap, scarf, belt, tie, etc around that foot and clasp the prop instead!) See a demo of this variation here. Exhale to frame the foot with the hands and push back to half splits - hips come to a right angle (ish) over the grounded knee, front foot flexes as the back of the heel grounds down, then fold over that front leg. Hold for 5-10 breaths, or take a few breaths to inhale forward to low lunge, exhale back through half splits. This movement can help make sitting in half splits afterward a little more comfortable. From half splits, inhale forward to frame the foot with the hands in a grounded low lunge. Then draw the right foot toward the left wrist, lowering the leg down into pigeon. Exhale to lower the upper body down over the front leg into sleeping pigeon. Use a similar action to low lunge here, magnetizing the front and back knees together energetically to help square the hips more toward the front of the room. This will encourage more sensation in the body. If your body doesn't feel warmed up enough for sleeping pigeon (or it's just too hot!) feel free to swing around to your hips and take seated figure 4. To do so, bring both feet to the ground in front of you, then draw your right ankle over your left knee and push out through the right knee. Stay here for 10-15 breaths. Inhale to rise out of pigeon, and exhale to release over to that right hip, coming onto the bum and drawing the right foot into the left thigh. From here, reach for the left foot, ankle, or shin with the left hand and inhale the right arm high for a side bend. Stay here for 5-8 breaths. Repeat steps 4-7 on the other side by swinging through to hands and knees and coming back into a standing forward fold. After your second Revolved Head-to-Knee pose, take poses 8 & 9! Draw both legs out wide, flexing through both feet before exhaling to lower the upper body down into a fold. Take care to keep the knees rotating toward the ceiling (external rotation through the hip), rather than toward the front of the room (internal rotation through the hip) as you fold over. Hold here for 8-10 breaths. Draw your feet in together, keeping the knees wide. Experiment with drawing the feet closer toward the hips or pushing them further away - neither is better, but the sensation in the hips and legs will feel different as you fold over. Option to draw the arms under the legs, palms face up for a slight opening through the shoulders as you fold forward. Hold here for 10-15 breaths. Option here to lower onto the back for reclined bound angle (supta baddha konasana), to take savasana, take a few moments for seated meditation, or to continue on with your day! And there we have it! A simple sequence to fit into your hectic summer day that will help you stretch out through tired muscles. Let us know in the comments if you have any favorite poses in your home practice! Advice from confused millennials who are on a mission to find the silver lining in everyday life.